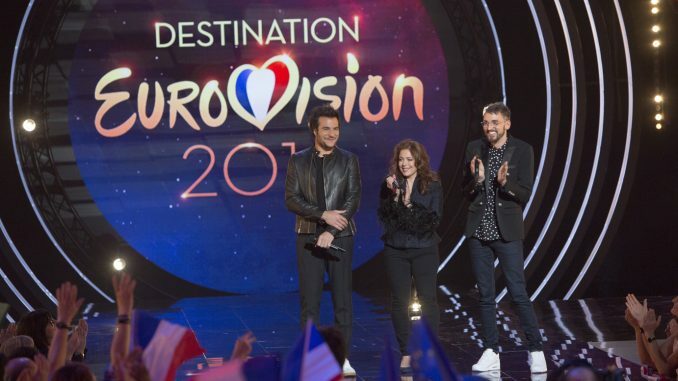 Who will represent France at Eurovision 2019? Tonight we will find out by the conclusion of Destination Eurovision! Arguably, Seemone with Tous Les Deux and Bilal Hassani with Roi are the favourites, but will we see a shock upset? Follow along as ESCDaily takes you through tonight’s proceedings. All times will be in CET, and you can watch the live show via this link. Note: the show has since finished. You can now read back on the reviews of each performance. 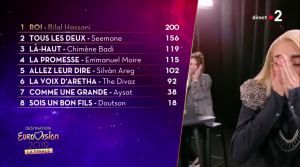 23:55 – Bilal Hassani wins! In a turn of events, Bilal wins the televoting, propelling him into first position. With a total of 200 points (150 of them being televotes), he will now represent France at Eurovision 2019. 22:50 – Voting starts now! A very strong and enjoyable way to finish the show! Aysat is able to manage the wordiness of the song better than the semi final, which let her down a fortnight ago. She gives off a great attitude and energy on stage, and the fun choreography suits the song perfectly. Vocals were very impressive also – a much improved performance. This performance receives a great reception from the audience, with the judges loving it too. The addition of footage from Bilal’s childhood is very impactful, and will connect with viewers at home. Is the song itself strong enough to win, though? 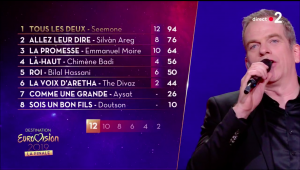 After a beautifully fragile performance from Seemone, it is clear why she is one of the favourites to represent France at Eurovision. The message is powerful and emotional, and will connect with viewers at home. Seemone’s huskiness (as a result of a missing vocal chord) is another unique element to such an elegant performance. The entry itself is quite strong, resemblant of a Maître Gims song, with good vocals to match. However, Doutson seems a little awkward on stage. Although having a child on stage would not be allowed at Eurovision, it adds a nice personal touch to the message of the song. When compared with Tous Les Deux, Emmanuel’s entry isn’t as strong of a ballad. However, the song is clearly very personal and the staging assists with evoking emotion. The message of this song will definitely connect with a lot of people. He was the winner of the televote in the second semi final – can he do it again? One thing is clear… these ladies can sing. Great harmonies as well as strong individual voices. It was undoubtedly fun, and received a great reaction from the audience. However, the composition is a little disjointed, with what seems like a jump between verse and chorus. The song may have changed name, but the fun and creative staging certainly hasn’t. The clever utilisation of a low camera angle, treadmill and cardboard cutouts offer a whimsical and entertaining aspect to the performance. It is distinctly French, and Sylvàn without doubt sells it and is able to navigate the wordiness of the song. A few tiny hiccups, but nonetheless a very impressive vocal performance. The staging works quite well, offering a bit of theatre to the performance. Overall, the song definitely suits Chimène as an artist, and it is clear that she believes in the song. However it’s potentially not strong or captivating enough to win tonight. 21:05 – Et c’est parti! All 8 competing artists are out to perform a rendition of Rise Like A Phoenix.